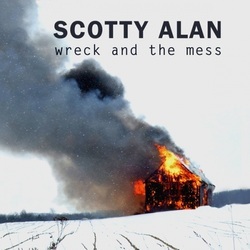 This is Scotty Alans debut album with all of the songs being self written and veering between mid tempo roots rock to a folksy countryish rustic feel! The rustic feel is not really surprising when you consider that Scotty lives in a log cabin he built himself on the upper peninsula of Michigan, near Lake Superior. last but a long, long way from least David Lindley on fiddle and acoustic lap slide. ocasionally reminiscent of the late Warren Zevon, always creating an excellent atmosphere that carries these songs along. title with some excellent fiddle and dobro playing and lovely harmonies supplied by Kristin Mooney. Your hero? is the story of someone who realizes he has slipped a long way down in his lovers estimation and is a song that is not only reminiscent of Warren Zevon vocally but in the whole style and tone of this mid tempo roots rocker. There is gravelly voiced slightly self deprecating humour on the mid tempo Ain’t much and some slightly off kilter humour on album closer Someone to fight, driven along by some lovely steel guitar playing. About half the songs on the album can qualify as ballads but all have variations in instrumentation, giving each its own personality rather than just becoming a mass of slow songs! Long ways from laughing is a lovely folksy ballad with the lead instrument being a hugely atmospheric fiddle, almost giving it a Celtic feel. Dam is a slow moody country song with a slightly unusual feel, telling a story of someone trying to protect himself from the loneliness of lost love. Not ready to be is another lovely country ballad with some nice mandolin and electric guitar playing, again with Kristin Mooneys lovely harmonies. So loud is a mid tempo rootsy song that is a little more sparse than some of the others on this excellent album and is led by the evocative sounds of a gorgeous accordion. As with many of the songs it has a slight, but to my ears quite detectable, Irish feel and strangely, on some of those songs, Scotty Alans vocals often seem to have a similar phrasing giving the album an even greater sense of being ‘roots based.’ Maybe I’m just being over sensitive to the sounds and should get out more, or maybe Scottys roots are showing through! songwriting and atmospheric vocals. Should make that ‘difficult second album’ an interesting listen and one that I’m already eagerly awaiting!